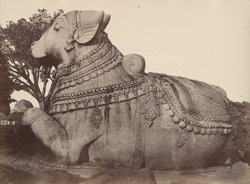 Photograph of the Nandi bull on Chamundi Hill near Mysore in Karnataka, from Taylor and Fergusson's 'Architecture in Dharwar and Mysore', taken by William Henry Pigou in 1856. Chamundi Hill, overlooking Mysore, takes its name from the goddess Chamundi to whom a temple is dedicated near its summit. The goddess, a form of Shakti who as Chamundi slew the demon Mahishasura, is the tutelary deity of the Wodeyars, rulers of the former princely state of Mysore. Nandi, the sacred bull, is the vehicle of Shiva, the consort of the goddess, and symbolises great strength and virility, the animal force in man. The massive Nandi sculpture on the road that ascends Chamundi Hill is 5 ms tall and the largest of its type in India. It was carved from a single rock at the behest of Dodda Devaraja Wodeyar (ruled 1659–72).